audio recording equipment to hypnotherapists and trainers. If you want state-of-the-art communication between you and your client, but without the complication of any wires, then the Hypnoke Wireless is for you. Simply plug it in, and enjoy instantly talking to your client in a quiet, peaceful environment. 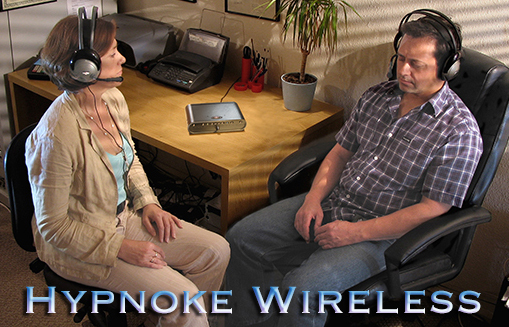 Hypnoke Wireless means no leads between you and your client. You can blend your voice with the supplied CD music and record everything onto an external device (optional), as required. Hypnoke Wireless is small, lightweight and portable (4 kgs with case). It is easy to use, small and looks superb. With practice, it can be set up in a couple of minutes and is perfect for all non-technical therapists. Hypnoke Wireless comes with two pairs of super comfortable, wireless headsets with attached microphones (so you can speak 'hands free'), instruction manual, two audio leads for playing music into the system and recording out to a PC/Mac or audio recorder and Colours Vol 1 with music licence (worth £34.99 on it’s own). The kit comes with a one year guarantee. Price is £597.00 including free delivery within the UK (excluding Northern Ireland). Buy Colours Vol.2 with music licence included in the kit for an extra £25.00 (normally £34.99). Call us today.